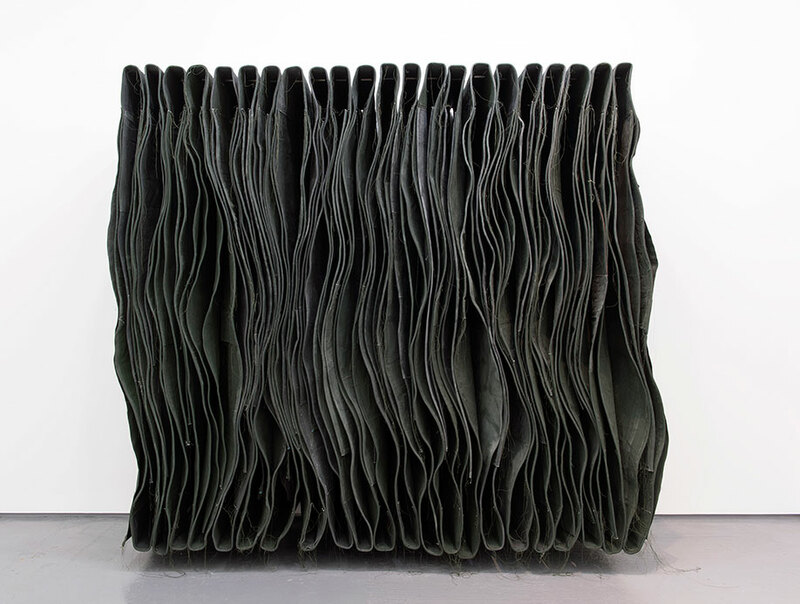 Painter Simon Callery’s works emphasise the physicality of paintings, informed by collaborations with archaeologists. Earlier this summer, he was artist in residence at DOLPH projects in Streatham. Emma Geliot went to see his new, site-responsive work and talked to DOLPH co-founders, Tash Kahn and Paul Cole, about their innovative residency programme. Callery’s temporary studio space was filled with canvases, torn, coloured, or waiting to be fixed in the hastily rigged up washing machine which whirred as we talked about the work and the residency project. The large swathes of cloth, dyed in earth colours, made the space feel more like a tannery than a studio. Several phases of making were evident, although the first, the direct working of canvas on the local streetscape, had already been completed to the bemusement of local residents. Exposing all the elements embodied in a work make for a more intimate and direct experience,” Callery believes. “DOLPH’s call for clarity in the process connected with my need to make work that revealed all evidence of its making as an ambition of the work. “For Simon, it was logical to use the space as his studio for the month because he was going to use the local area of Streatham as his subject”, Cole explains. “Simon was here six days a week, for four weeks, working in the space and local area. He had several students from Wimbledon UAL painting course assisting him, mixing and applying pigments, drawing and shaping the canvas out on the streets. I remember my phone conversation with Stefan Gant and ask how Callery’s work relates to archeology? “I’ve worked with archeologists on excavation sites since 1996”, he tells me. “What’s important to point out is that the works that have resulted in from collaborations don’t take archeology as there subject. It is the impact of the excavated landscapes, the tangible sense of temporality and the experience of landscape as material that has shaped the work. Being a witness to excavation led me to recognize the limits of image-based works to communicate the experience of landscape. This led to subsequent development of paintings that aim to involve viewers in a broader sensory experience. It is worth remembering that the development of western painting is entirely bound to the development of image. It should be no surprise that painting is well placed to critique our image-saturated culture and perhaps now it can offer an alternative. I’m getting a better idea of what he’s been up to on the streets of Streatham. “I like the idea that a painting starts out as a form of field recording”, Callery says, “…albeit, in the context of Streatham, an urban field recording. I want signs of this initial contact to remain evident and to characterize the work. Recently, I have made a number of works in the landscape and when DOLPH invited me to work with them I was keen to confront the urban environment again. Working in the urban environment is entirely different from a remote landscape. You are forced to lower your guard, lift your head and look around you and take the work onto the streets. Inevitably, there were a couple of interesting moments with a disgruntled drunk and a suspicious shop owner, as well as some genuine interest from fellow pedestrians. The pigment, soaked into the canvasses which are draped like pelts around us in the DOLPH studio, adds an incredible textual quality to the marked, cut and gouged cloth. I want to know how Callery makes decisions about colour. Then I point to works that are more advanced. They are obviously three-dimensional, as they protrude into space, but they are also absolutely painting, not sculpture, aren’t they?